InventoryPlus can be launched by clicking on InventoryPlus Icon found on desktop or Please follow the below step to open the Software. Go to ‘Start’ ->All Programs ->Press InventoryPlus. 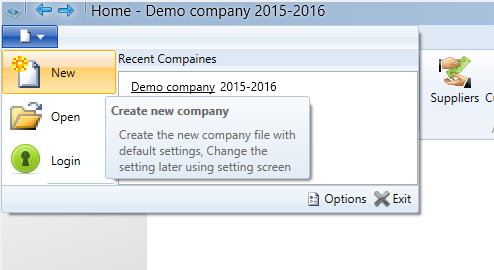 Press ‘New’ button to create new company file. After pressing the new button it will ask the location to create the new company file. Enter the company name which you want to store all of your entered data like ‘stock’,’Account’ etc. System will create the new file for each company, File will be secured with industry best encryption. 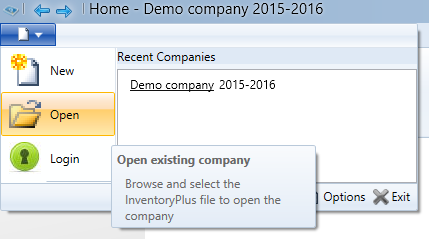 Click on ‘Open’ button to open the existing company. 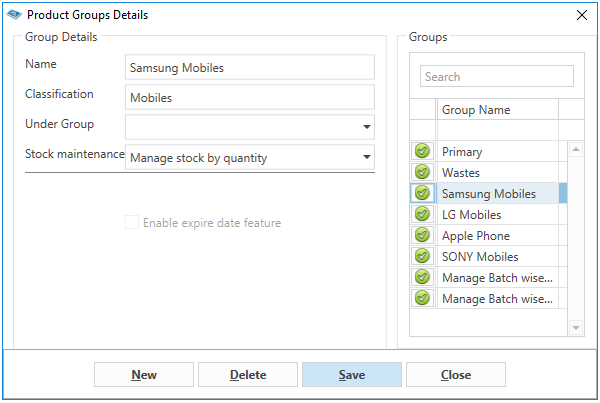 Clicking on button will open the file explorer dialog box to select company file, All recently opened company available on Recent Companies list. InventoryPlus simplifies multiple companies using operations. Note: Demo company(Demo_company.ims) available for demonstration purpose. It contains the sample data(Stock details, Purchase and sample Sales details). This can be used to understand the different features available in InventoryPlus. Select ‘Demo_company.ims’ located in installed location. Note: This is the default credential for all new company. Later it can be changed using user settings screen. Select the "Settings" from InventoryPlus Desktop menu, It will pop-up one more dialog box as shown below. 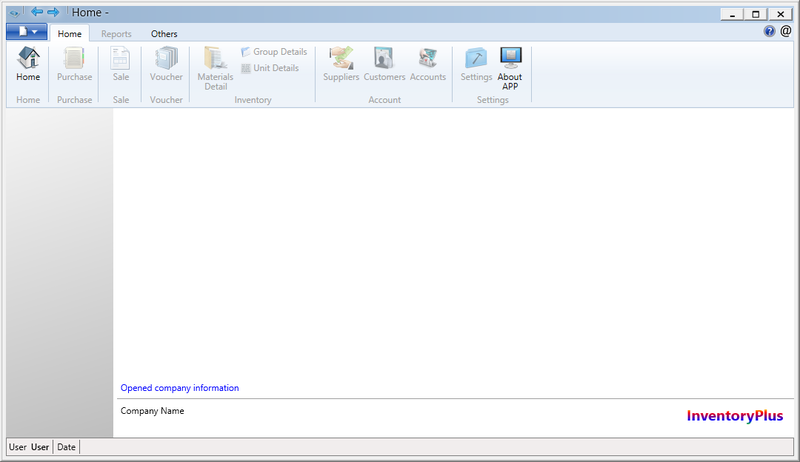 You can configure the company details using this screen. You can find the different tabs as its own functionality. 1. 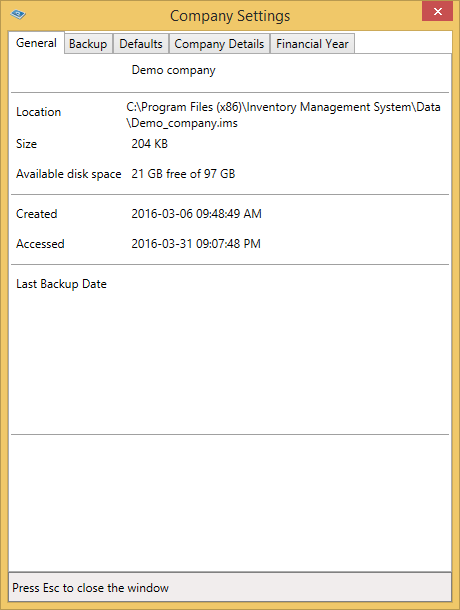 General : It will display the company file details like size of the file, location of the file, last accessed etc,. 2. Backup : Backup/Restore can be performed using this tab. 3. Add. Fields : Used for capturing the additional fields if required in application..
4. Defaults : General details can be updated, Bill number, receipt numbers and other operational details. 5. Company Details : Company name and address details will be available. 6. 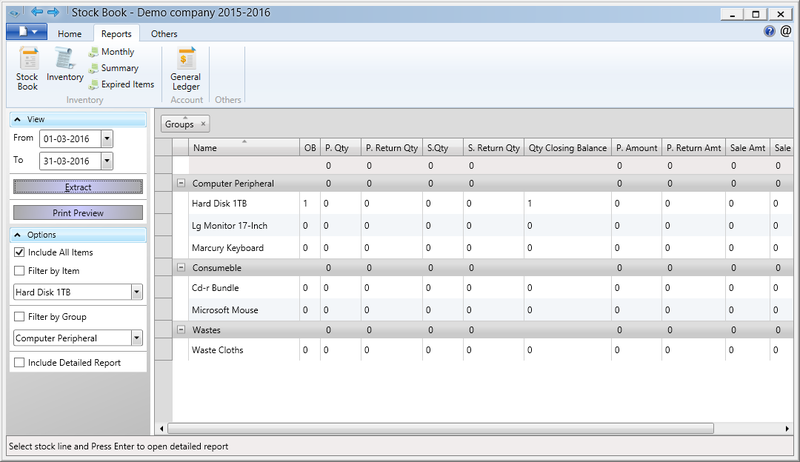 Manage Reports : This section will helps to edit the report templates. 7. Financial Year : Financial year configuration and new financial creation section. Adding new Product Item (Stock/Inventory) Details to InventoryPlus. 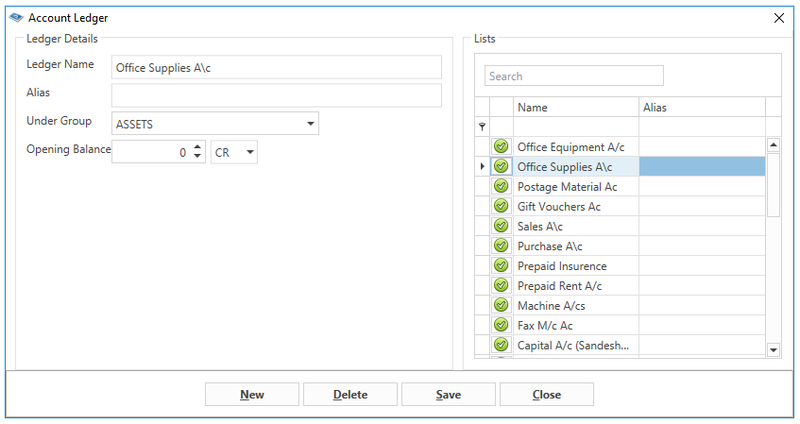 InventoryPlus Home page you can find the Products Details and Group Details and Unit of Details tool bar, It can be used for updating the item master. Ex. We are going to create all items like ‘Nokia N72’, ‘Motorola Slim v3’, ‘O2’ all products which used while creating invoice. Important thing is we have to select the Group under selection list, which we have created in last section. While creating the Item ‘Nokia N 72’ we have to select ‘Nokia’ ‘Under’ selection List. Note : More option visit Products details topic. 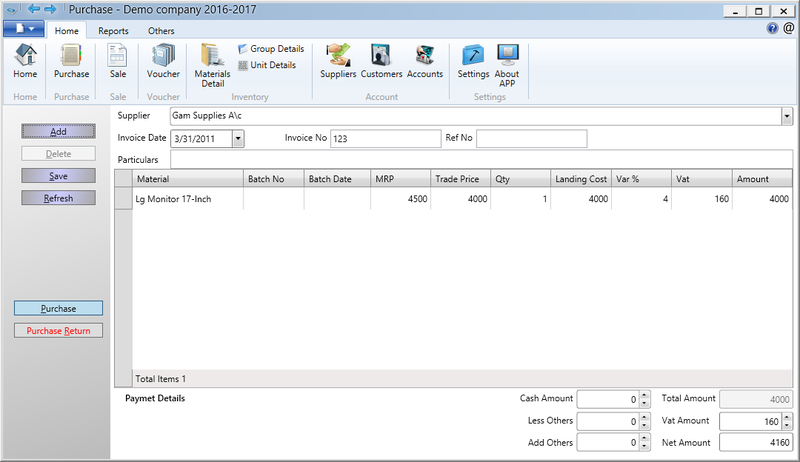 Adding Account book details to InventoryPlus. Click on "Accounts" tool bar button to open the account creation screen, It will display the window like below with button 1.Add, 2.Edit 3.Delete, Right side of the window shows all Created accounts. Press ‘New’ Button to add new Accounting ledger. Press ‘Delete’ button to delete the Selected Account. Note : More option Please check InventoryPlus Help under ‘Ledger Account’. Clicking on "Customers" tool bar button will open the customer entry screen as shown below. In that window you are entering the ’Customers’ Details like address, name etc. Customer used while entering the sales bill. Later you can generate the Account related Report (like Account book) etc. Clicking on Suppliers tool bar button will open the supplier entry screen as shown below. In that window you are entering the’ Vendor/Supplier’ Details like address name etc. Suppliers details will be used while entering the purchase invoice in purchase entry screen. 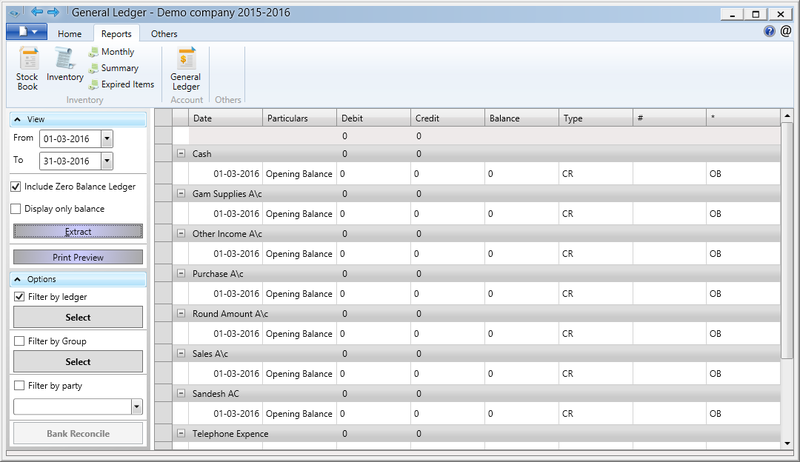 Later you can generate the Account related Report (like Account book) etc. Go to Home and Purchase (Control + Alt + P), It will display the below screen, used to enter the Purchase/Purchase Return invoice. 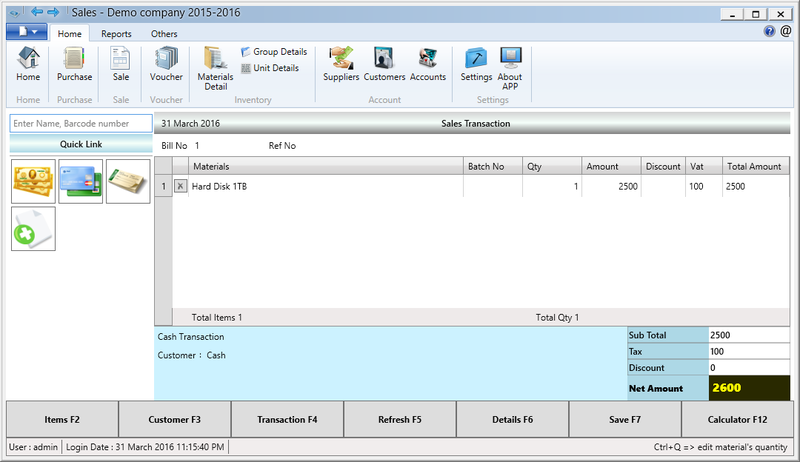 Entering ‘Purchase’ invoice will add the purchased item quantity to existing item stock book. 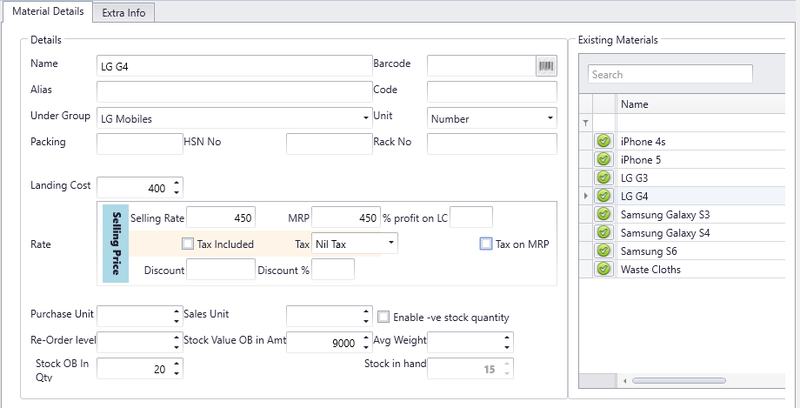 ‘Purchase return’ will negate the item quantity from existing Item stock book. You are going to select the existing ’ Vendor/Supplier’ from ‘Supplier’ list. First time this list will be empty. You have to create Trader by clicking on Suppliers tool bar button as explained on point 8. After creating the suppliers from the supplier window, next time you can select the account from selection, So no need of creating the account each time. System automatically creates the account ledger for that ‘Vendor/Supplier’ forever. Note : More option Please check InventoryPlus Help under ‘Transaction Entry’->’Purchase Entry’. Go to Home and Sales (CTRL + ALT +S) tool bar button will open the sales entry screen. Used to enter the Sales/Sales Return Bill. Entering ‘Sales’ invoice enter item name on text box and hit enter will add the item. Select the sales return entry click on "Details" button found on bottom of the page and select the "Sales Return" button. You are going to select the existing Customer by clicking on 'Customers’ button. First time this list will contains ‘Cash’. If you want to create the Customer then you have to create the’ Customer’ using "Customers" tool bar button as mentioned point 7. Cash Payment: If it is just cash and carry bill, then you have to select the ‘cash’ from ‘Customers’’ selection or clicking on image will select the cash account. Default selection is the Cash account. No need to select this whenever making the new sale entry. Cash account will add received bill amount to ‘cash in hand’’ account ledger. If you won't mention customer details each time just select cash. Credit Card Payment: If payment mode is credit card then clicking on image will set the credit card payment mode. This payment is charged against to bank ledger selected in Setting screen default section. Cheque Payment: If payment mode through Cheque then clicking on image will set the Cheque payment mode. 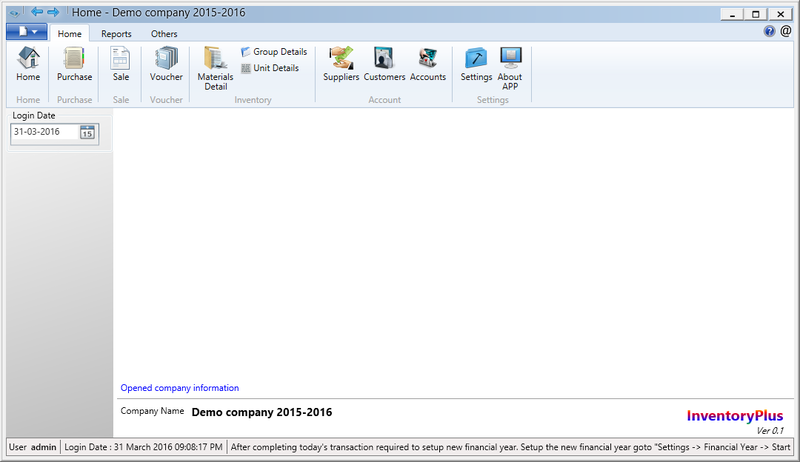 This payment is charged against to bank ledger selected in Setting' screen default section. Combination of payment type is possible by clicking on Details button. Lists of quick view options available on bottom of the screen with shortcut key. Note : More option Please check InventoryPlus Help under ‘Transaction Entry’->’Sales Entry’. Clicking on Reports tab on tool bar menu will display the list of report available in InventoryPlus software. All Inventory related Report grouped under ‘Inventory’ and Account related under ‘Account’ and Value section. 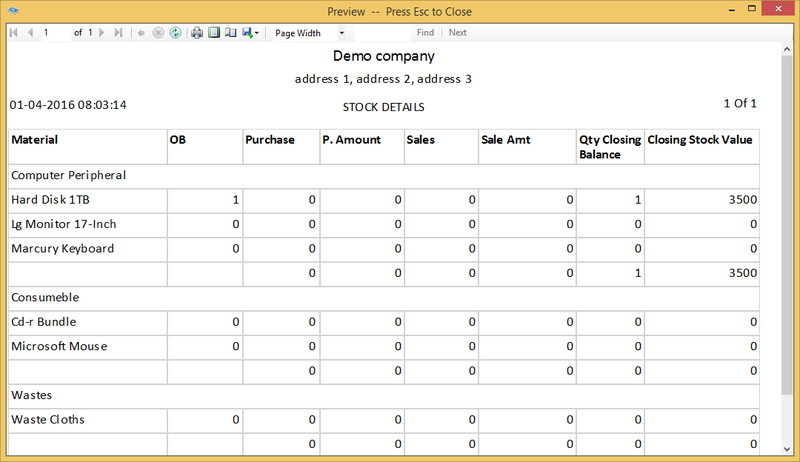 Go to Reports ->StockBook, It will display the window as shown below with multiple options. You have to select the Date and Clicking on ‘Extract’ button display the report details on screen. In option section allowed to select several sub options, based on selection report will get generated. Clicking on "Print Preview" will open the preview window. You can export the report to different format or directly take the printout as shown below. You have to select the Date and Clicking on ‘Extract’ button display the report details on screen. In option section several options you can found out based on selection report will get generated. You can select the individual party report by selecting Filter By Party or you can select the all customer/vendor details by clicking on Filter By Group/Filter by Ledger button. Note: General Ledger is nothing but a account book.